The lens is solidly built, with a combination of metal and good plastics. Nothing wobbles and the buttons are good to handle. There is a rubber lip (for weather resistance) on the metal bayonet mount. The zoom ring has a good resistance, the focus ring could be a bit easier to move, but overall I am very satisfied with both. The focus is done using the method fly-by-wire, but it doesn’t feel like with the other NX lenses, where the focus ring has mostly no resistance. Overall I am very happy with the quality Samsung delivered with this lens. The lens is well balanced when used on the NX1, but I wouldn’t want to use the lens with one of the smaller cameras like the NX500 or NX3300 for a longer period. Unfortunately there is a small glitch with the NX30: My fingers are to thick to fit conveniently between the lens and the handgrip of the NX30. When zooming the rubber surface of the zoom ring scrubs my finger. Persons with smaller fingers might not encounter this problem. There is another small glitch due to the size of the lens. The barrel of the lens partially shadows the AF lamp and therefore it might reduce autofocus performance in the shaded areas. The autofocus speed is very fast and the lens provides one of the fastest focus motors in the NX system. The noise emission is very low. In quite environments you might notice that there is a permanent gentle noise. 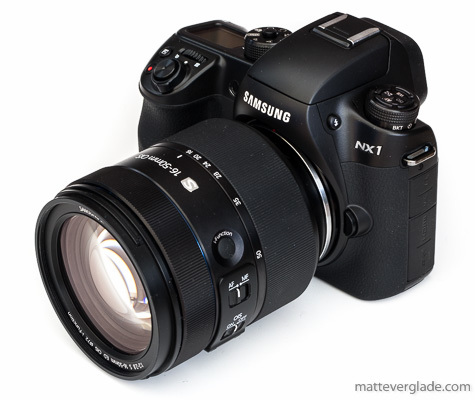 The manual focus is fly-by-wire, but feels much better as with all other fly-by-wire lenses produced by Samsung. There is a dedicated AF/MF switch on the lens. The lens provides internal focussing, which means the front element is not moving during focussing. This avoids problems when you are using a graduated neutral density filter or a polarising filter. Unfortunately you need to be aware of the fact that the lens has problems with field curvatures. Therefore be careful when choosing the location of your focus point! A quick AF allows to capture surprising moments. 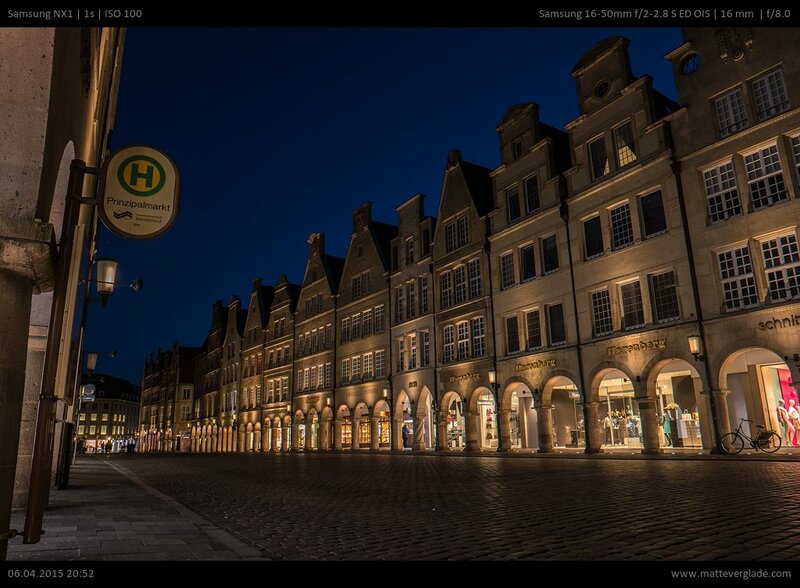 Regardless of the focal length the OIS helps me to get sharp photos until 0,3 seconds exposure time. Without OIS I can hold the camera steady between about 1/13 seconds (16mm) and 1/30 seconds (50mm). This results in an improvement of two to three stops with OIS depending on the focal length. This implies that you can hold the camera steady quite easily without OIS, which is probably a result of the weight and the well balanced combination of the camera and the lens and the OIS works slightly better with higher focal lengths. 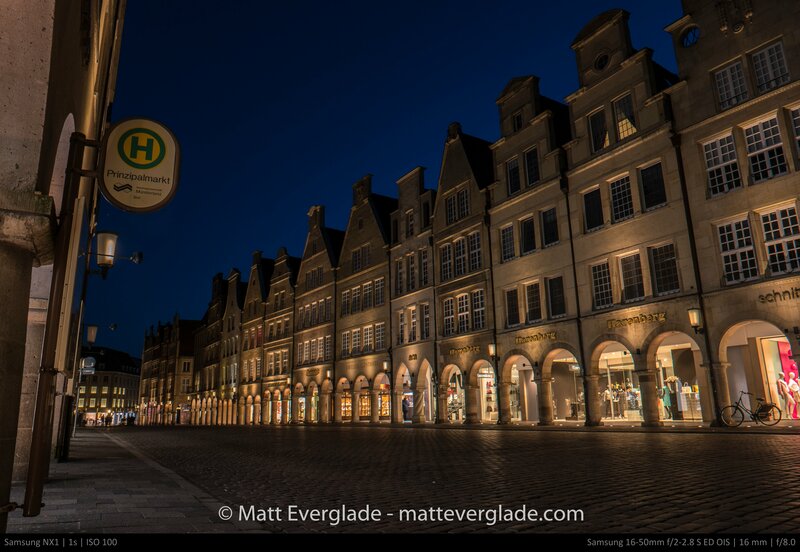 The combination of the fast apertures and the good OIS really helped me to get sharp shots in darker areas or at night time, e.g. when shooting in the city during the blue hour. With my previous zoom-lenses I would have to use a tripod for many of those shots. Generally the contrast is very good on this lens and is slightly reduced only at maximum aperture with some focal lengths. The center and midframe are mostly sharp, but the corners give an indifferent result. I’d say average image sharpness is good at the wider focal lengths (16 to 20mm), very good in the middle range (24 to 28mm) and only mediocre from 35mm onwards. Center sharpness is good already at f2 and improves till f2.8 to a very good level until f11 is reached where diffraction kicks in slowly. Contrast is reduced at f2, but improves at f2.8. The corners are weak at maximum aperture which slowly improve till 5.6 to a mediocre level. CA are visible in the corners. The midframe is slightly worse than the center, but much better than the corners at the respective apertures. 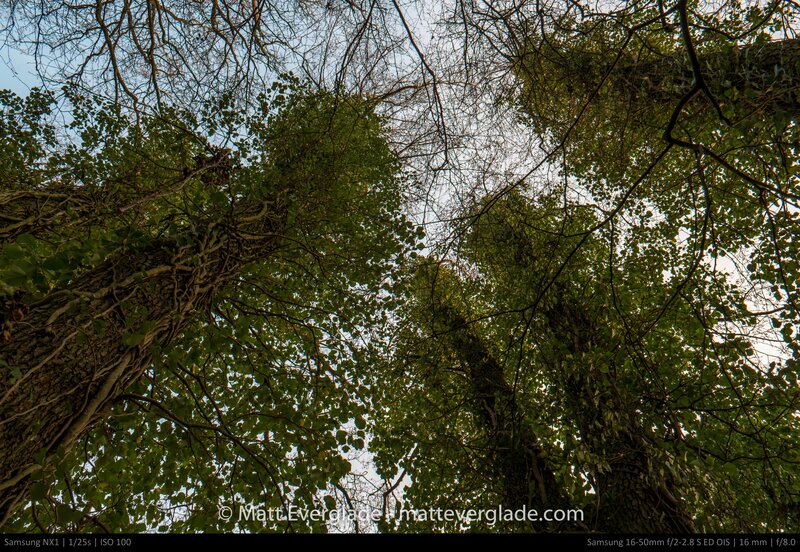 The lens behaves similar at 20mm with slightly improved results. Contrast is is already improved at f2.2 and corners are already on a mediocre level from f4 onwards. The center and midframe sharpness at 28mm is very good already at maximum aperture and stays on this high level until f11, where diffraction slowly creeps in. The corners are decent at maximum aperture and improve to a very good level at f4, which is delivered until diffraction starts. 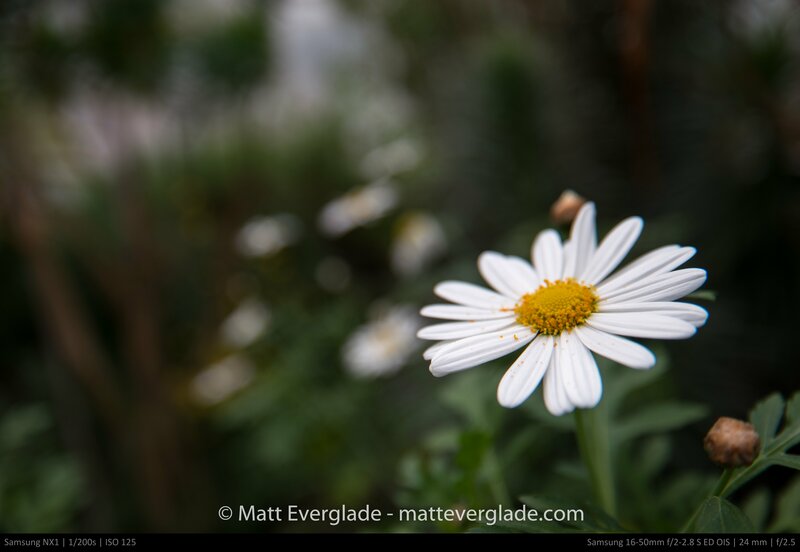 The overall image quality is best at 28mm with very good results across the frame. The Samsung 30mm F2 lens delivers slightly better center performance, but surprisingly the corners are better on the zoom-lens tested here. 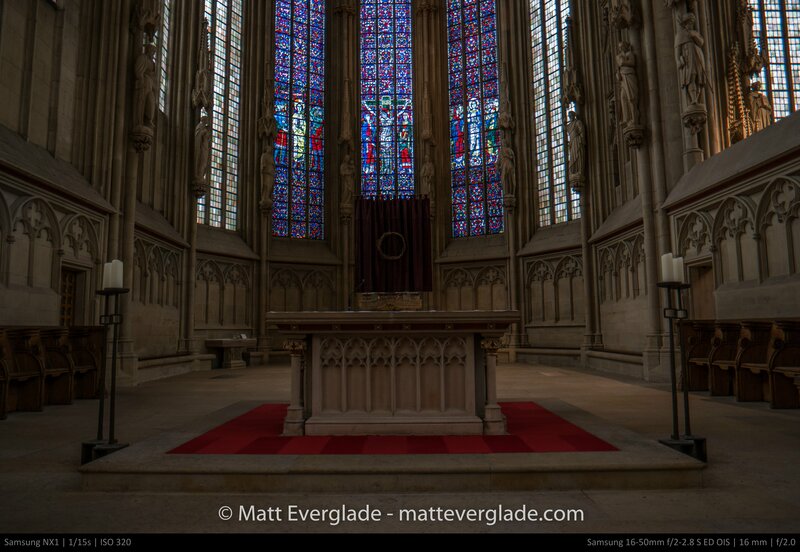 The lens behaves similar at 24mm with slightly worse results. Center and midframe results are nearly equal, but the corners are a bit more soft at 24mm from f2.5 till f4 and reach a quite good level from f4 till f11. The last bits of CA are visible in the corners, which are gone at 28mm. The very good results at 28mm decrease drastically at 35mm. The center performance at f2.8 and even f4 is only mediocre and the corners are really soft. The center is good between f5.6 and f11, but corners are only mediocre. From f16 onwards diffraction is clearly visible. 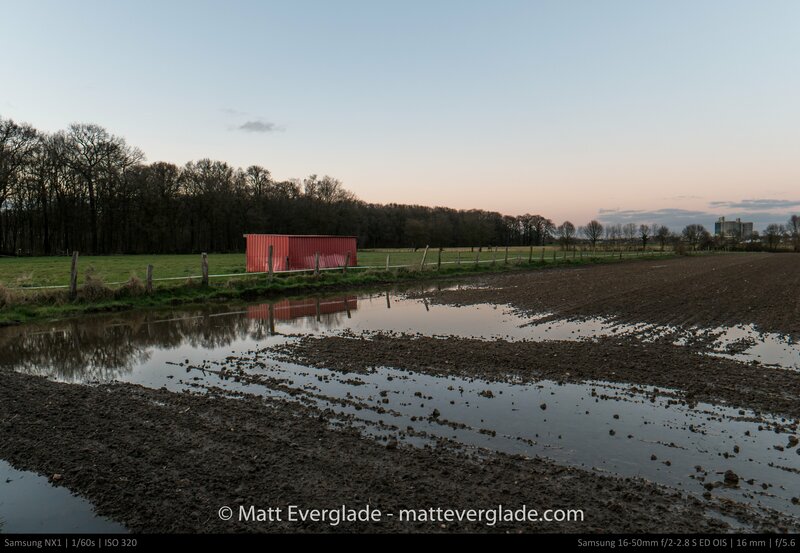 After the surprisingly good results at 28mm, I would have expected better results at 35mm. The results from 35mm are mostly transferable to 50mm aswell. 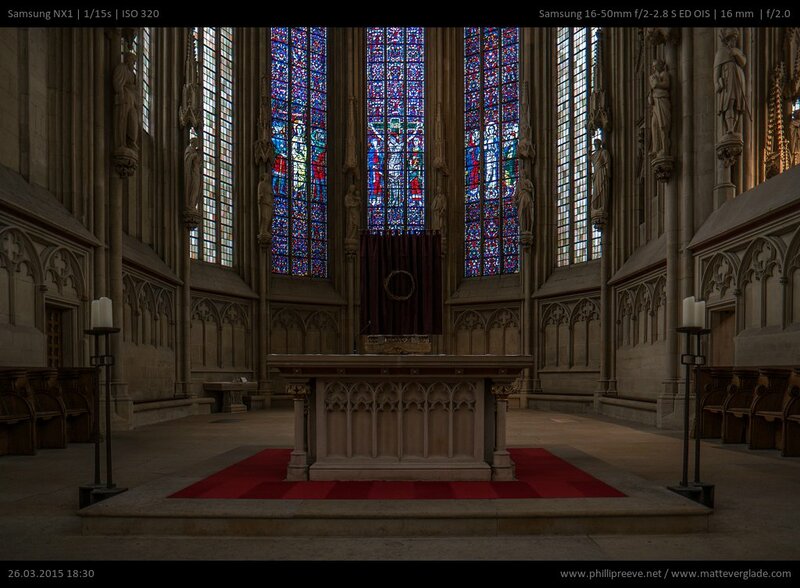 Corners are mostly soft and even the Samsung 16-50mm f3.5-5.6 PZ delivers slightly better results than this lens. Contrast is slightly reduced at maximum aperture. The nine aperture blades are rounded which mostly leads to round or nearly round bokeh circles. The circles are round at all apertures for wider apertures. 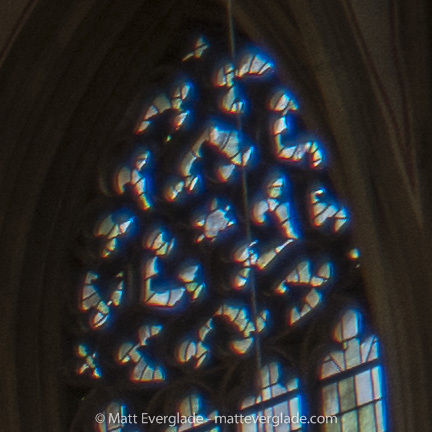 You’ll notice that the circles get more and more rough the closer you get to 50mm and the more you close the aperture. Distortion is well controlled for a lens of this type. At 16mm there is about three percent barrel distortion which decreases towards the middle of the focal range and increases again to about one percent with the lens zoomed to 50mm. Anyway, distortion should be automatically corrected by Lightroom based on the information Samsung delivers with their RAW files. Vignetting is barely visible and clearly below one stop at maximum aperture. For a lens with this specifications it is a really good result. 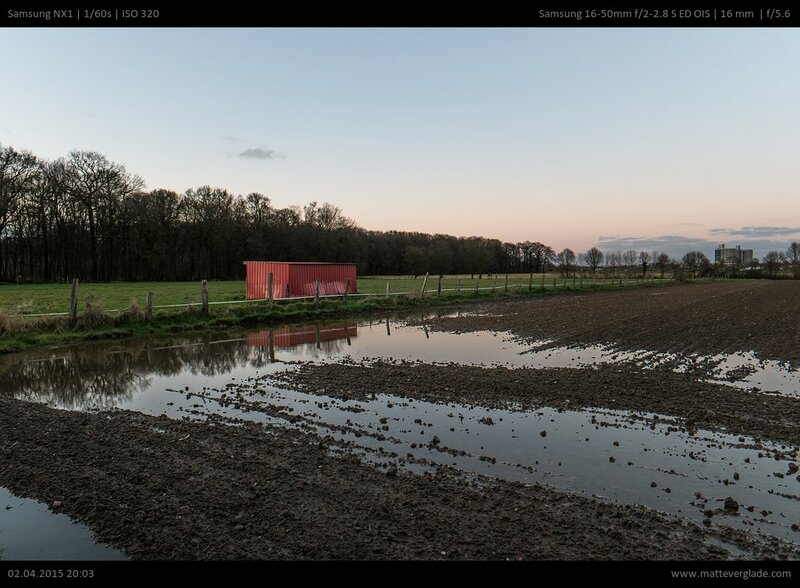 Anyway, vignetting should be automatically corrected by Lightroom based on the information Samsung delivers with their RAW files. The lens tends to produces some flares throughout the whole zoom range. They are not very intensive though. The contrast is not reduced by much when shooting against the sun. You can use the supplied lens hood to block some sunlight to avoid flares. By the way: The lens hood can be put on the lens vice-versa, but this hides the buttons (i-Function, OIS, AF) and the focus ring completely. Lateral chromatic aberrations can occur mostly in the midframes and corners at bright edges with an average size of one to two pixels. They are well controlled around 28mm focal length. Longitudinal chromatic aberrations are not noticeable at all, which is an excellent result for a lens of this type. The lens tends to show CA in certain situations. After applying CA correction in Lightroom. 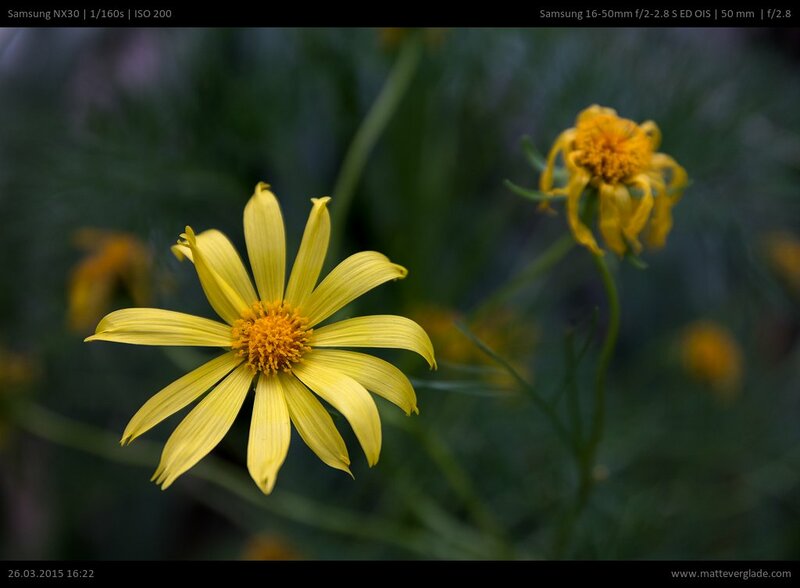 Samsung offers four zoom lenses with a similar focal length coverage. Samsung 16-50mm F3.5-5.6 PZ: This is the newest addition to the “cheap” kit lenses offering the same focal lengths. It has an integrated OIS, delivers a good auto focus speed and is much smaller and lighter. It is an power zoom which makes it more suitable for videographers. You pay for the advantages with a worse image quality. If you’re on a budget this lens could be well suited for you. 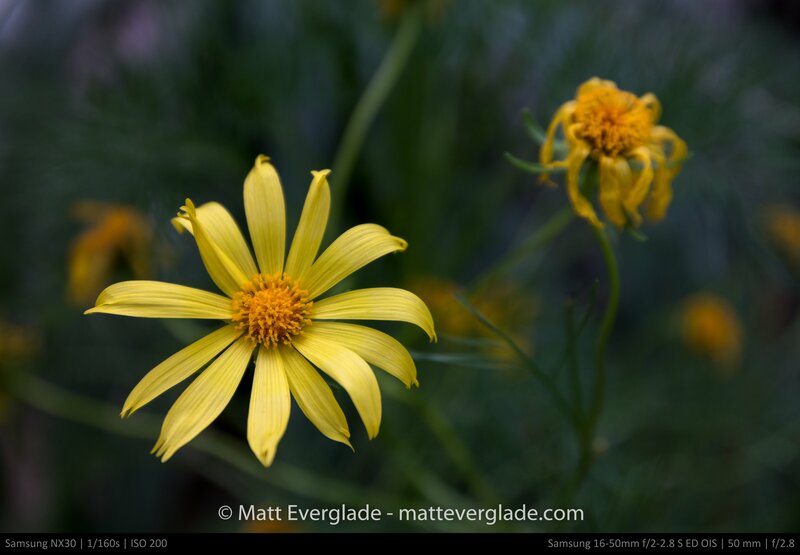 Samsung 20-50mm F3.5-5.6: This lens has a reduced focal length, but has a slightly better overall image quality than the other “cheap” kit lenses. It’s therefore much lighter and smaller, but offers no OIS and has only a slow and noisy AF. 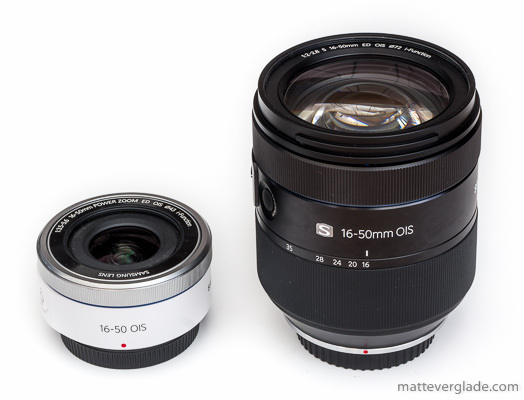 Samsung 18-55mm F3.5-5.6: I can’t think of a reason why someone would want this kit lens. All other mentioned zoom lenses have some kind of advantage compared to this lens. Samsung 16mm F2.4, 20mm F2.8, 30mm F2.0 and 45mm F1.8 (pancake) lenses: If you want to go for the maximum image quality this is for you, but you need to change lenses. In the lower focal lengths (16mm, 20mm) the aperture is not as fast as with the zoom lens, but the 30mm and the 45mm are faster. With one of these lenses you could also get a more compact camera for daily use. IQ wise the 30mm and the 45mm are superior to the zoom lens, the 16 and 20mm are on the same level as the zoom lens. You might also think about buying cheap legacy zoom lenses. I wouldn’t suggest to do so as those old lenses usually perform quite bad on newer sensors and I don’t know of a single legacy lens with similar specifications anyway. This unique lens is a good addition to the Samsung NX lens line-up. Overall I like the lens as it is very well built and the handling feels good. Combined with a NX1 it is very well balanced, though it could be a bit too large for smaller cameras. 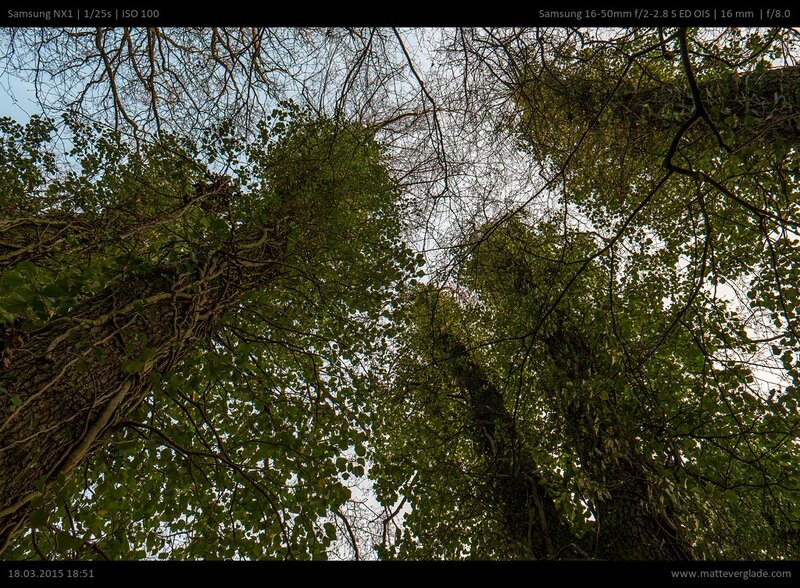 Image quality overall is good, but from 35mm onwards the sharpness is a bit disappointing. therefore I liked to use this lens for portraits, architecture, “macro” and street photography as it is working very well in low light situations and gives a nice bokeh. Nevertheless I am more into landscape photography and for this type of photography I’ll continue to use my other lenses. The bokeh is smooth and could be used for some nice macro-like shots. Autofocus performance is good and we had no problem to use tracking for sports. If you don’t need the best image quality in the corners, but a lens which is weather sealed and gives you the flexibility to shoot in low-light situations without a tripod, I’d suggest this lens to you. More stores/countries can be found on the “How to support me” page. Thank you! 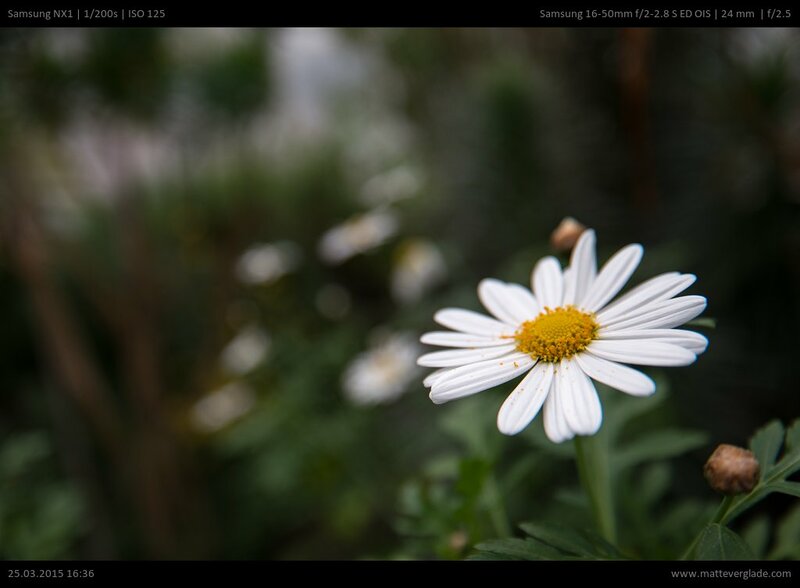 Comments on "Samsung 16-50mm F2-2.8 S Review"
Nice review ! I hope you will test the 50-150mm S soon ! nun weiß ich, dass ich “zartere”Fingerglieder habe als du … ;). Also ich habe da keine Probleme betreffs des Ringes. Grundsätzlich richtig gut geschrieben, manches halt schuldet im Detail der Übersetzung ins Deutsche …_ niemand ist perfekt; schon gar nicht ein Programm ;)! Du weißt ja, ich nutze dieses Objektiv an einer NX30. Probleme gibt es, so man wirklich mal den integrierten Blitz nutzen möchte/ muss. Da ist ein Schatten vorprogrammiert. Mir richtig aufgefallen” im Schacht” vor Ort / Bergwerk. Habe meine Schüler im Betriebspraktikum an verschiedensten Orten in ihre Tätigkeit dokumentiert. Innen, außen, Bewegung, Kunstlicht,Landwirtschaft, Verkauf,Handwerk, Bau – eben verschiedene Bedingungen. Highlight war Erzabbau im Schacht vor Ort / Erzgebirge-Sachsen – Nähe Aue. Da überall war es gerade für mich das “Uni-Objektiv”. Die NX30 habe ich da mit der “ungeliebten” Handschlaufe getragen, Handling war ok.
Irgendwie habe ich dass Gefühl, dass man mit dem 16-50 mm S die Kamera “bewusster”trägt als mit etwas kleinerem, z.B. dem PZ. Deine Meinung zum Bokeh kann ich nur bekräftigen! Dir nochmals danke für diese deine Einschätzung! Ciao und schöne Ostern ! der integrierte Blitz schattet eigentlich bei allem, was nicht gerade Pancake oder ähnlich klein ist, ab. U.a. daher nutze ich den Blitz auch nie, den könnte man sich wirklich sparen. 😉 Ich hatte Spaß mit dem Objektiv, aber laufe doch lieber leichter rum. Hallo Matt, danke für den Testbericht des 16-50 S.
Ich nutze diese Optik auch seit 2 Wochen und bin sehr zufrieden. Jetzt vermisse ich auch mein 18-35 1.8 nicht mehr. Man kann, wie du schön bemerkt hast, durch den OS und die Blende 2.0 viele Aufnahmen in der Dämmerung aus der Hand schießen. Auch die “Tracking” Kapazität ist vorbildlich. Bei 8 pics/sek. habe ich fast immer 5-6 scharfe Aufnahmen dabei und letztendlich behält man ja meist nur eine einzige. Noch ein schönes Osterfest und allzeit gut Licht (hier in Hanau kommt gerade mal wieder die Sonne hervor). Matt, what would be your recommendation for best landscape lens(s) for the NX-1, since you do not seem to like the 16-50 for this purpose? 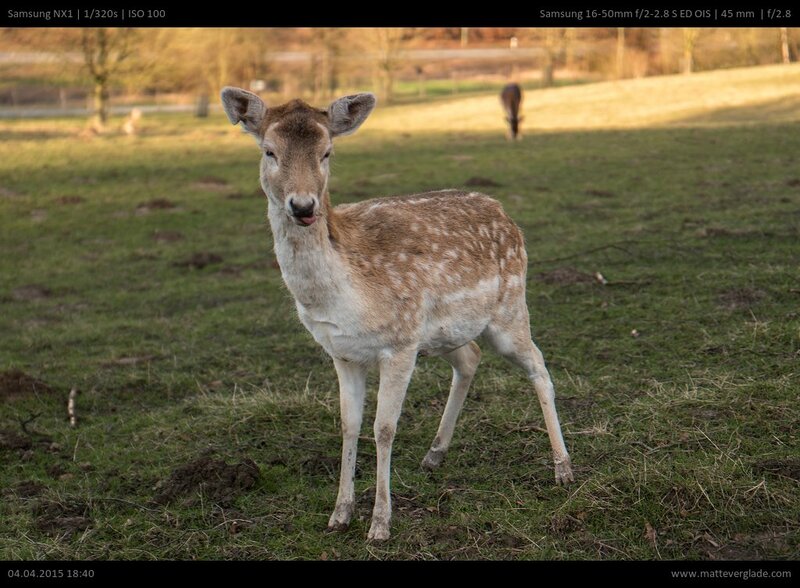 I can’t agree with the passing mention that Samsung NX 18-55mm is a generally poor lens. You need to be aware that this lens design has multiple generations: marked roman numeral I, II and III. There were bad design problems with gen I, some mfg quality problems with II. However, 18-55mm III has suprisingly QUICK focus even with contrast method and is as sharp, if not better then the 20-50mm collapsing lens design. The 20-50mm lens is hard to use, focus is super slow, the front element rotates (bans CPL filter) and a hood or petal is not included. I was only able to find a collapsible rubber hood for the 40,5mm thread. I don’t say it’s a poor lens, but I don’t see an advantage over the other lenses as one of the lenses always outperforms the 18-55mm in some regard, so based on one’s criteria there is probably a better lens in the Samsung lens line-up. Again, it’s not a poor lens, but just doesn’t has any “highlights”, but performs decent overall. thank you very much for this review; I have read it with great interest! I have recently bought a Samsung NX30 camera and even though I am happpy with the performance of the 18-55mm kitlens, I am currently contemplating to buy either the 30mm and 45mm prime lenses or this Premium 16-50 S lens. I read in your review that with regards to IQ the 30mm and 45mm prime lenses outperform the Premium S lens and I was wondering how big the difference is? I am by no means a pixelpeeper but if the difference is noticeable when looking at regular pictures taken with my camera then I think I will go for the two prime lenses instead of the S lens.